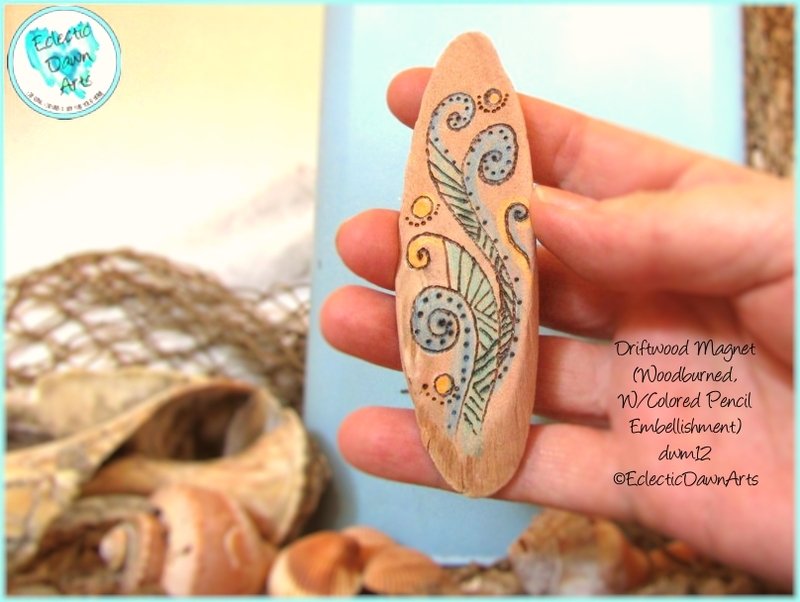 Driftwood Magnets – Free Shipping! 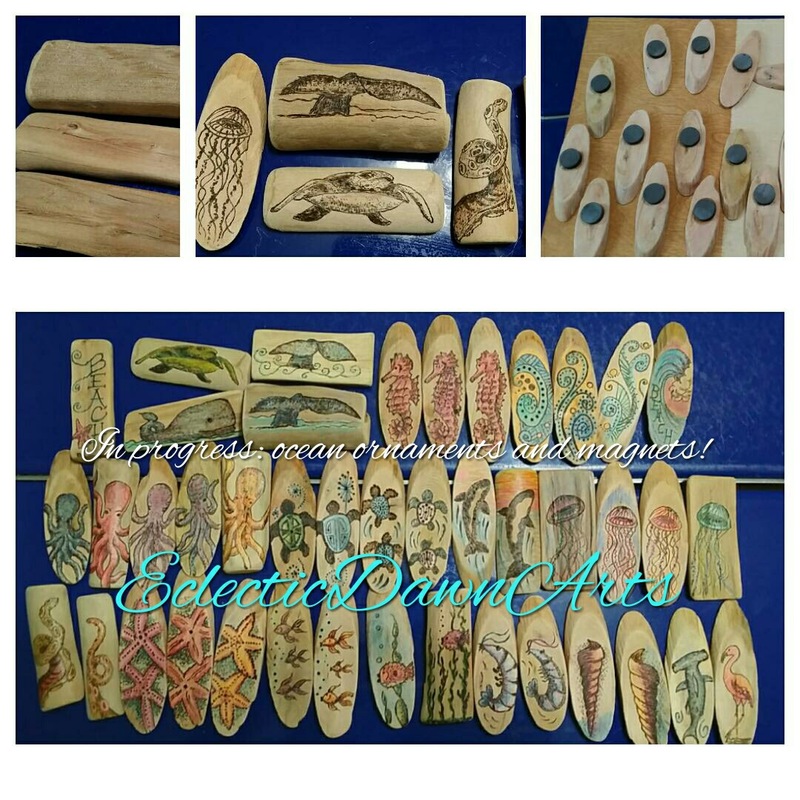 With pyrography and colored pencil, Dawn transforms small pieces of driftwood into soft and colorful scrimshaw-like sketches of sealife on magnets. Each piece is unique and numbered. 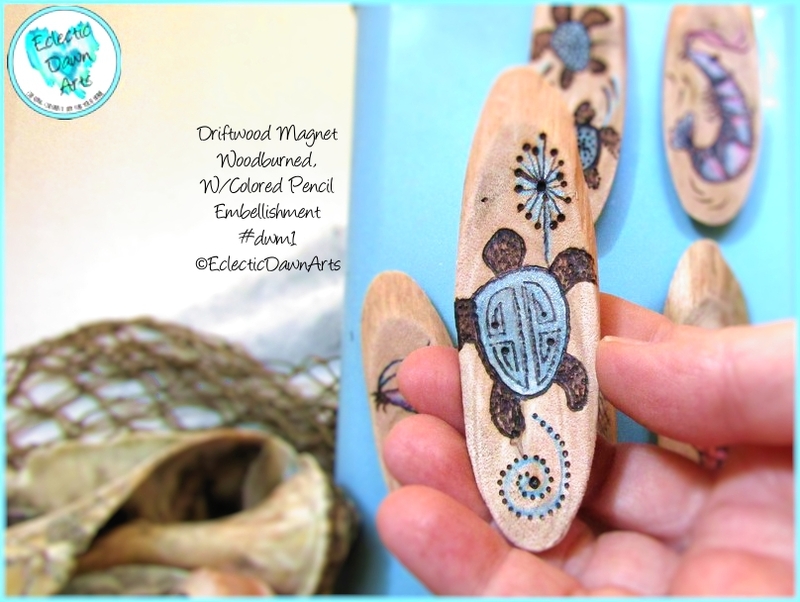 Tribal Turtle Driftwood Art Magnet, #DWM1 (accessories not included). Approximately 4” x 1” oval. Bring a bit of the beach to your corner of the world with this handmade piece of ocean art. Each piece of driftwood is woodburned, then embellished with colored pencils, and left in a natural state. This is a decor object, not intended for children. FREE SHIPPING. 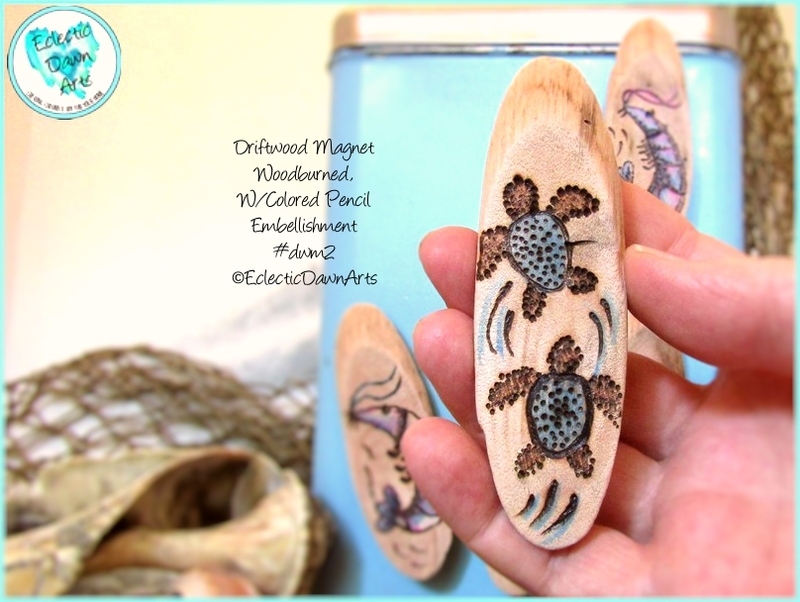 Baby Turtles Driftwood Art Magnet, #DWM2 (accessories not included). Approximately 4” x 1” oval. Bring a bit of the beach to your corner of the world with this handmade piece of ocean art. Each piece of driftwood is woodburned, then embellished with colored pencils, and left in a natural state. This is a decor object, not intended for children. FREE SHIPPING. 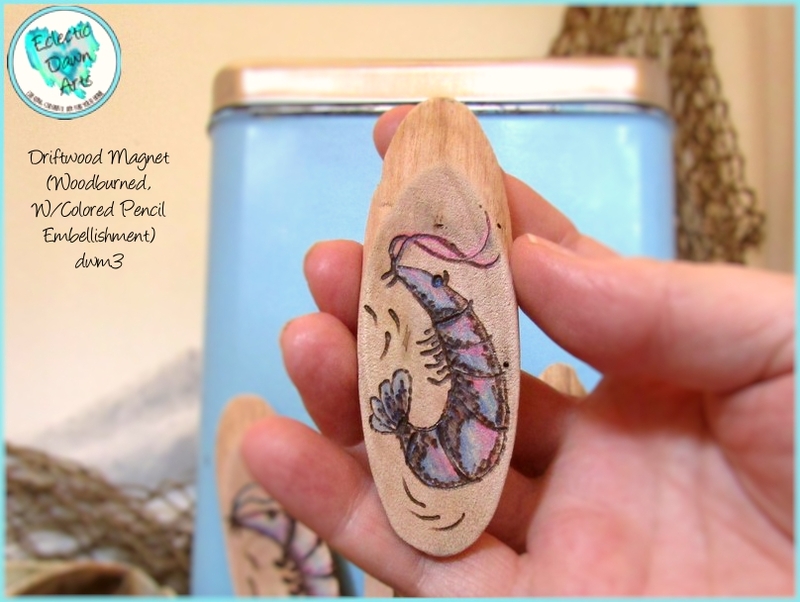 Dancing Shrimp Driftwood Art Magnet, #DWM3 (accessories not included). Approximately 4” x 1” oval. Bring a bit of the beach to your corner of the world with this handmade piece of ocean art. Each piece of driftwood is woodburned, then embellished with colored pencils, and left in a natural state. This is a decor object, not intended for small children. Free shipping! 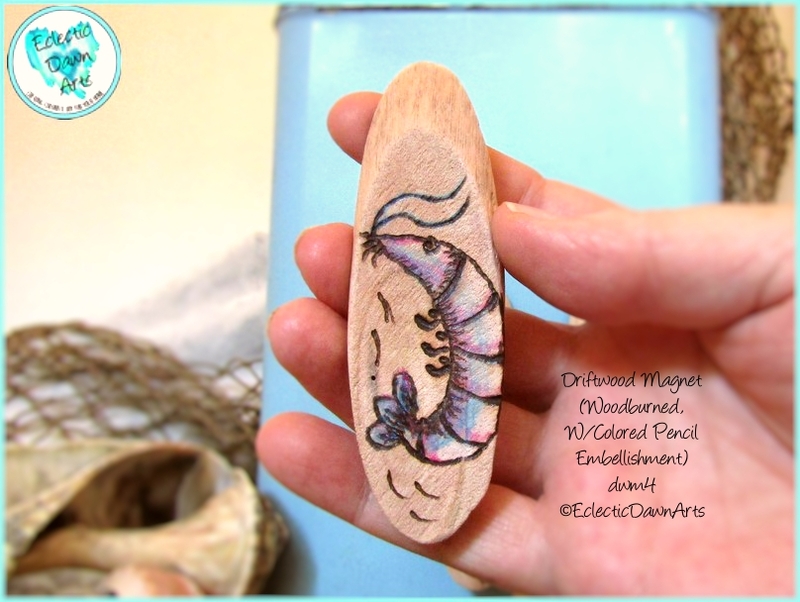 Shrimp Driftwood Art Magnet, #DWM4 (accessories not included). Approximately 4” x 1” oval. Bring a bit of the beach to your corner of the world with this handmade piece of ocean art. 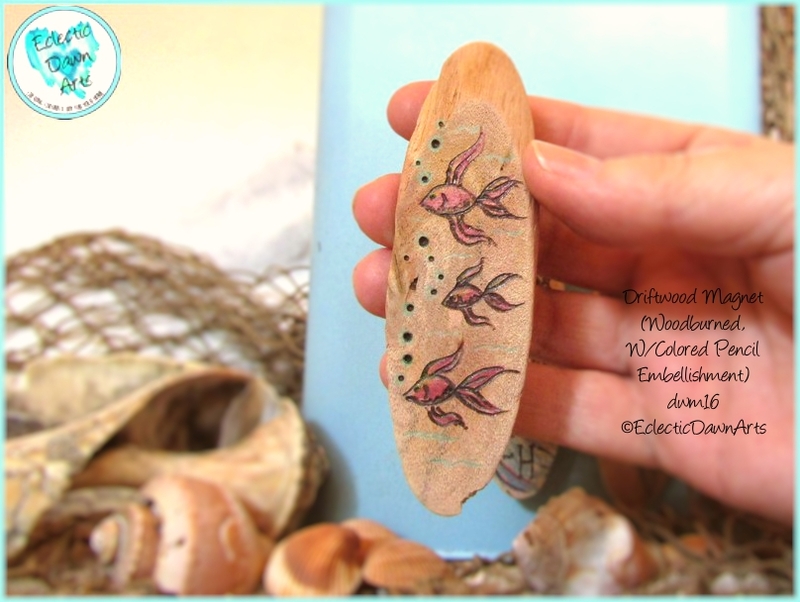 Each piece of driftwood is woodburned, then embellished with colored pencils, and left in a natural state. This is a decor object, not intended for children. Free shipping! 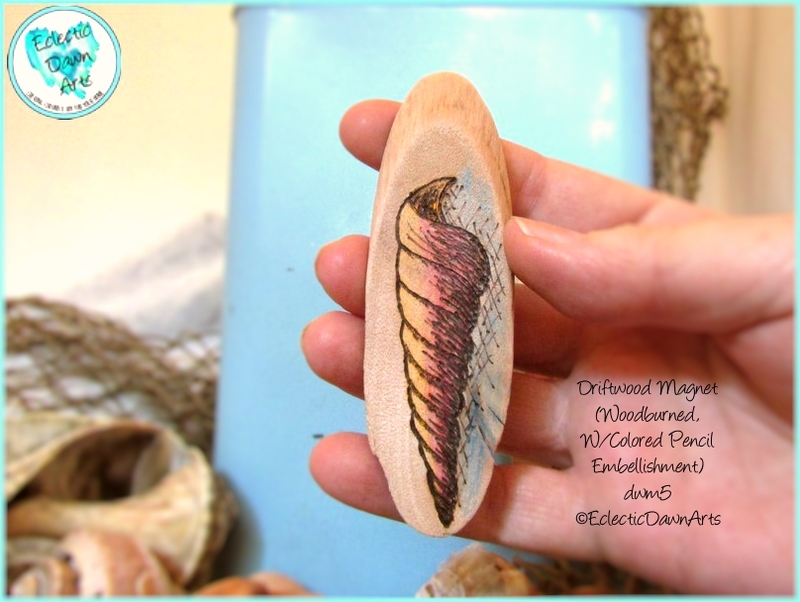 Spiral Shell Magnet (Driftwood Art Magnet), #DWM5 (accessories not included).Approximately 4” x 1” oval. Bring a bit of the beach to your corner of the world with this handmade piece of ocean art. Each piece of driftwood is woodburned, then embellished with colored pencils, and left in a natural state. This is a decor object, not intended for children. Free shipping. SOLD. 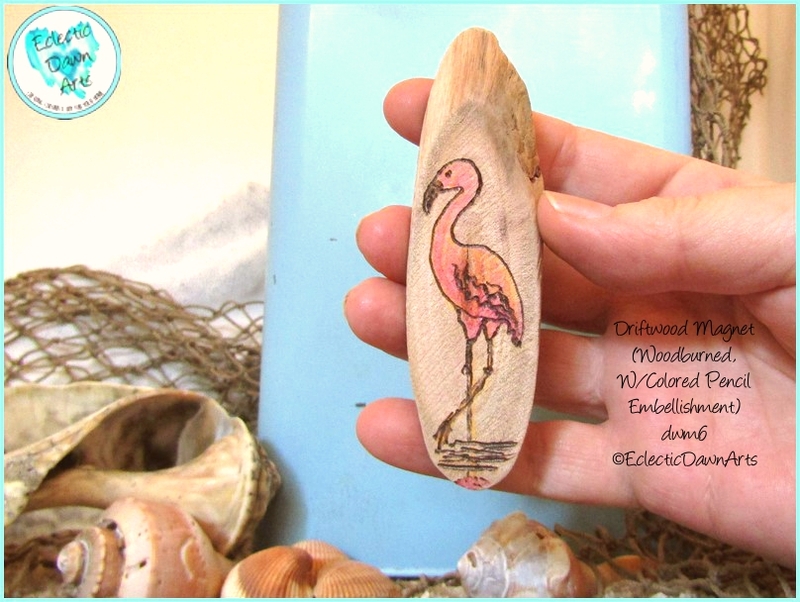 Flamingo Driftwood Art Magnet, Pyrography and Pencil, #DWM6 (accessories not included). Approximately 4” x 1” oval. SOLD #DWM8 (accessories not included). Approximately 4” x 1” oval. Bring a bit of the beach to your corner of the world with this handmade piece of ocean art. 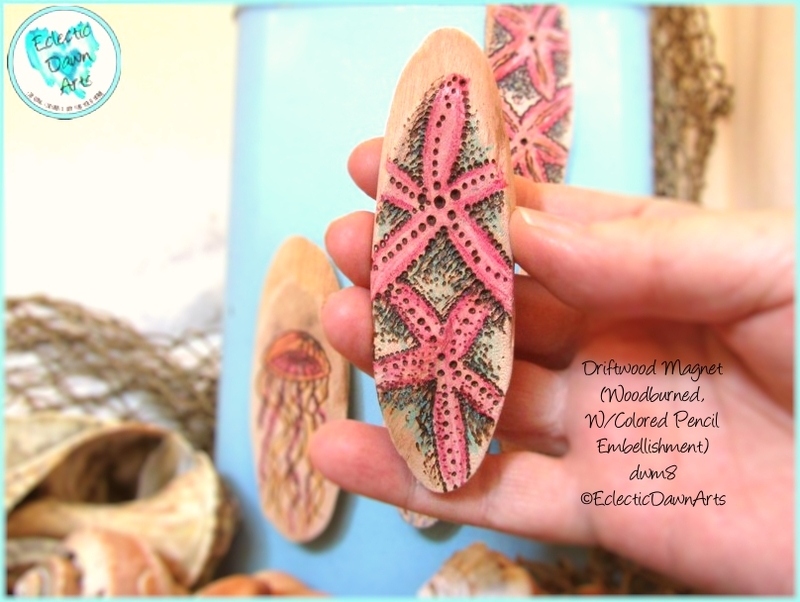 Two red starfish driftwood art magnet, #DWM9 (accessories not included), approximately 4” x 1” oval. Bring a bit of the beach to your corner of the world with this handmade piece of ocean art. 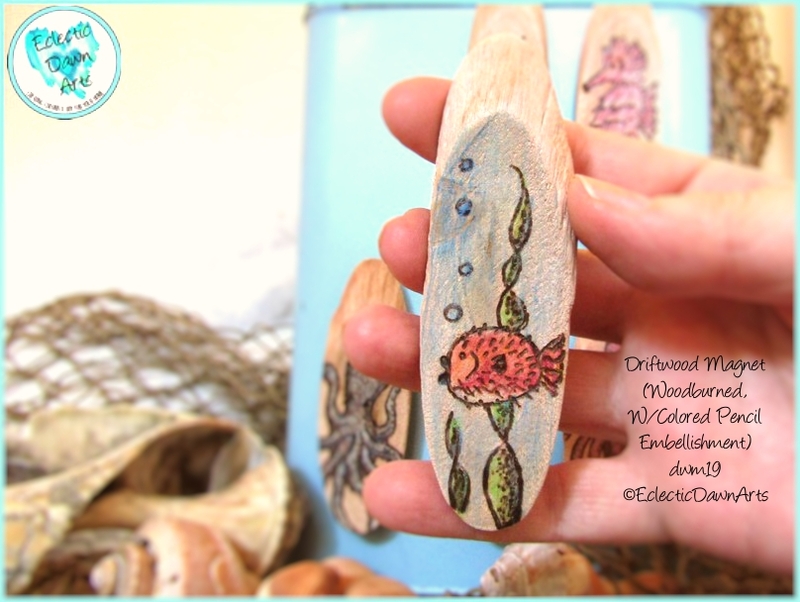 Each piece of driftwood is woodburned, then embellished with colored pencils, and left in a natural state. This is a decor object, not intended for children. Free Shipping. 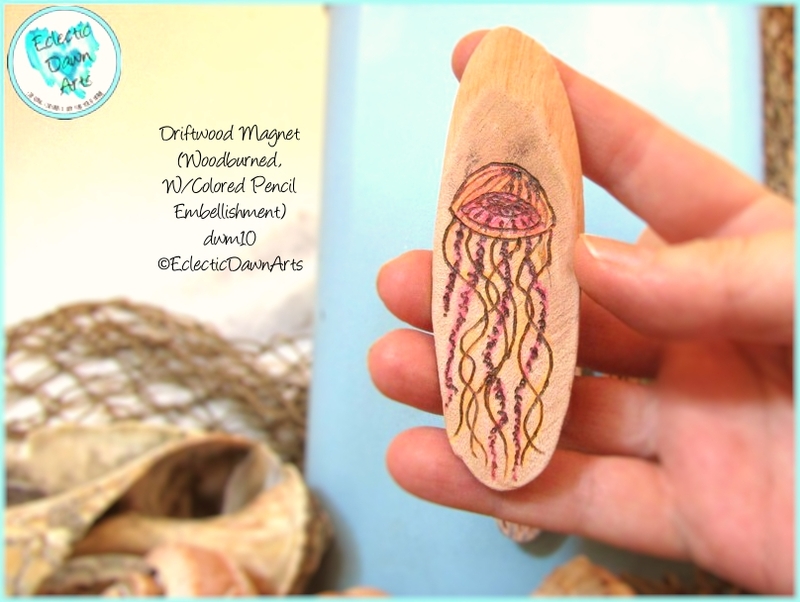 Colorful jellyfish driftwood art magnet, #DWM10 (accessories not included), approximately 4” x 1” oval. Bring a bit of the beach to your corner of the world with this handmade piece of ocean art. 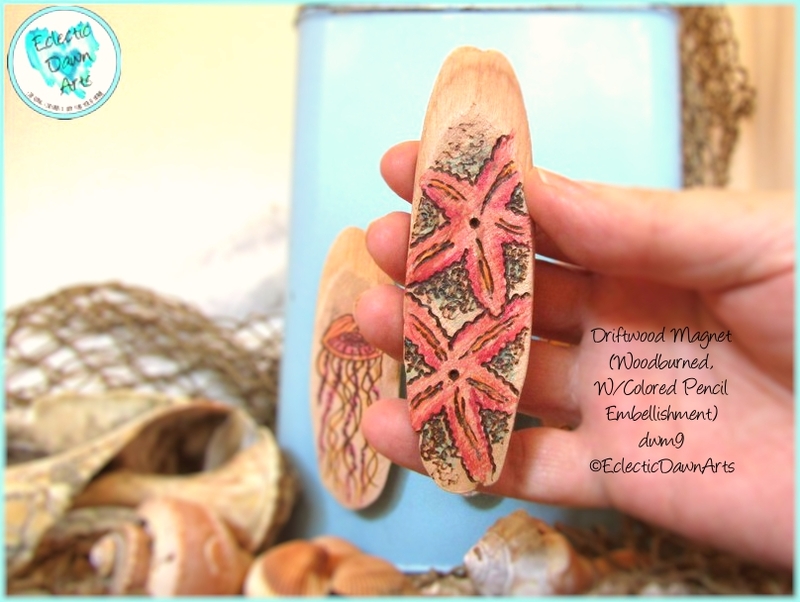 Each piece of driftwood is woodburned, then embellished with colored pencils, and left in a natural state. This is a decor object, not intended for children. 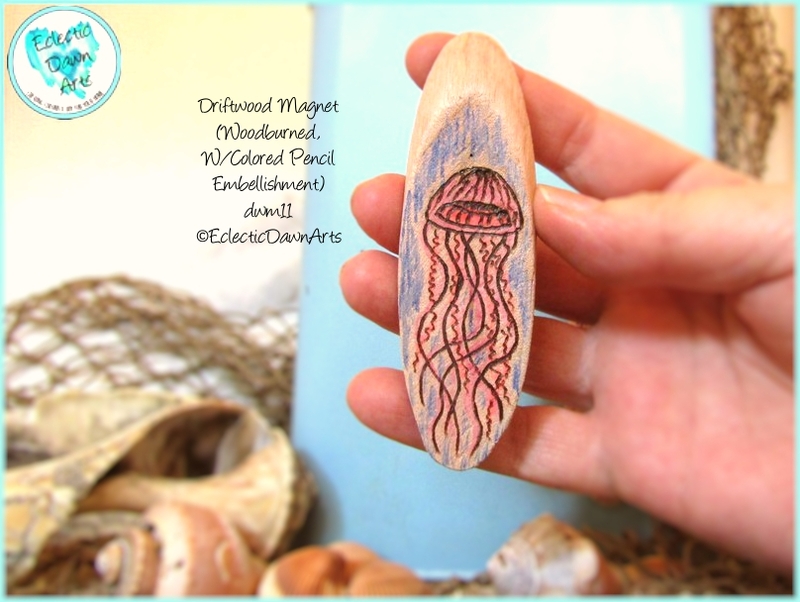 Colorful Jellyfish, blue background, Driftwood Pyrography Art Magnet, #DWM11 (accessories not included). Approximately 4” x 1” oval. Bring a bit of the beach to your corner of the world with this handmade piece of ocean art. Each piece of driftwood is woodburned, then embellished with colored pencils, and left in a natural state. This is a decor object, not intended for children. Free Shipping! 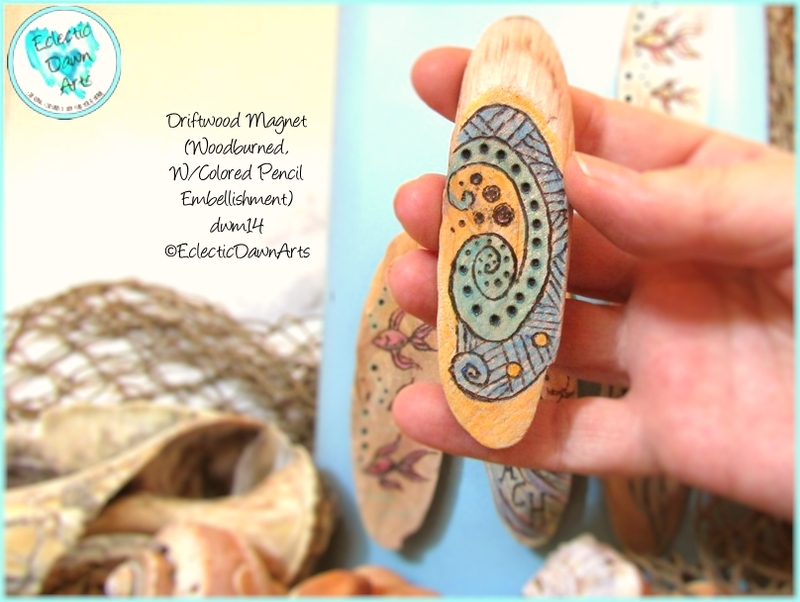 Abstract Wave and Sun Driftwood Art Magnet, #DWM12 (accessories not included), approximately 4” x 1” oval. Bring a bit of the beach to your corner of the world with this handmade piece of ocean art. Each piece of driftwood is woodburned, then embellished with colored pencils, and left in a natural state. This is a decor object, not intended for children. Free Shipping! 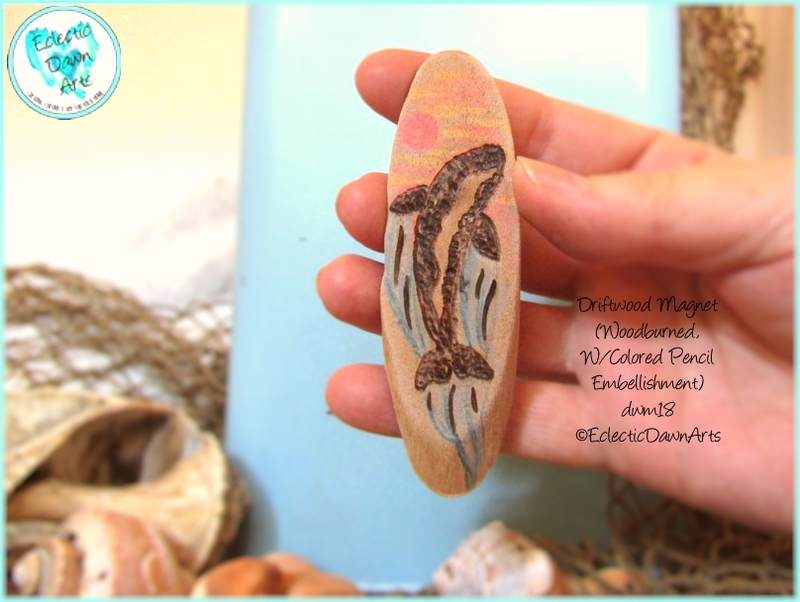 Abstract surf and sun design, Driftwood Art Magnet, #DWM13 (accessories not included), approximately 4” x 1” oval. Bring a bit of the beach to your corner of the world with this handmade piece of ocean art. Each piece of driftwood is woodburned, then embellished with colored pencils, and left in a natural state. This is a decor object, not intended for children. Free Shipping. 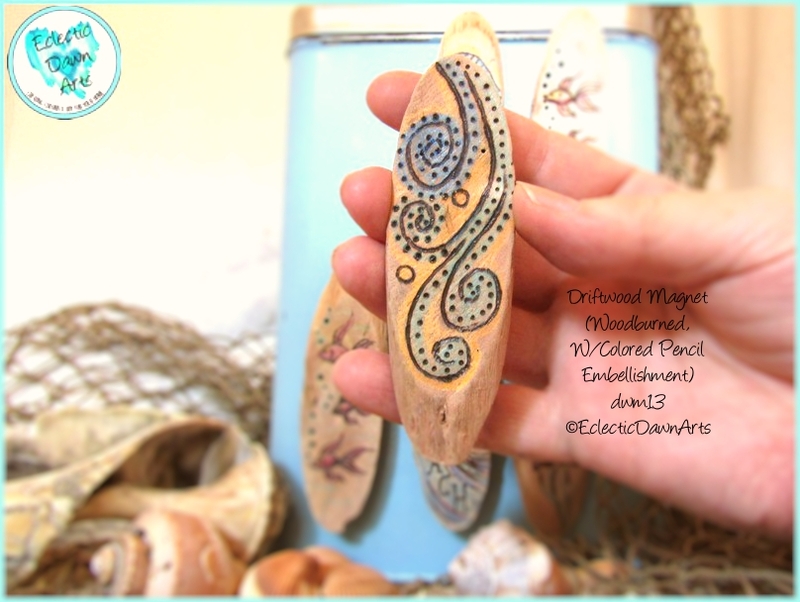 Abstract wave curl, surf magnet, driftwood art magnet, #DWM14 (accessories not included), approximately 4” x 1” oval. Bring a bit of the beach to your corner of the world with this handmade piece of ocean art. Each piece of driftwood is woodburned, then embellished with colored pencils, and left in a natural state. This is a decor object, not intended for children. Free shipping. 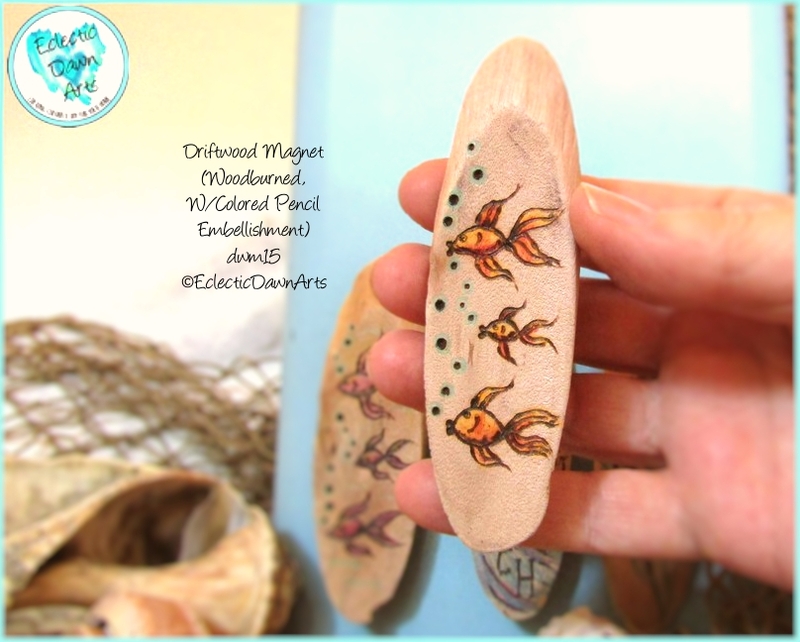 Three fancy fish (perhaps goldfish or betta fish in this fantasy world), Driftwood Pyrography Art Magnet, #DWM15 (accessories not included), approximately 4” x 1” oval. Bring a bit of the beach to your corner of the world with this handmade piece of ocean art. Each piece of driftwood is woodburned, then embellished with colored pencils, and left in a natural state. This is a decor object, not intended for children.Free shipping. Three purple fancy fish magnet, driftwood pyrography and pencil art, #DWM16 (accessories not included), approximately 4” x 1” oval. Bring a bit of the beach to your corner of the world with this handmade piece of ocean art. Each piece of driftwood is woodburned, then embellished with colored pencils, and left in a natural state. This is a decor object, not intended for children. Free shipping. 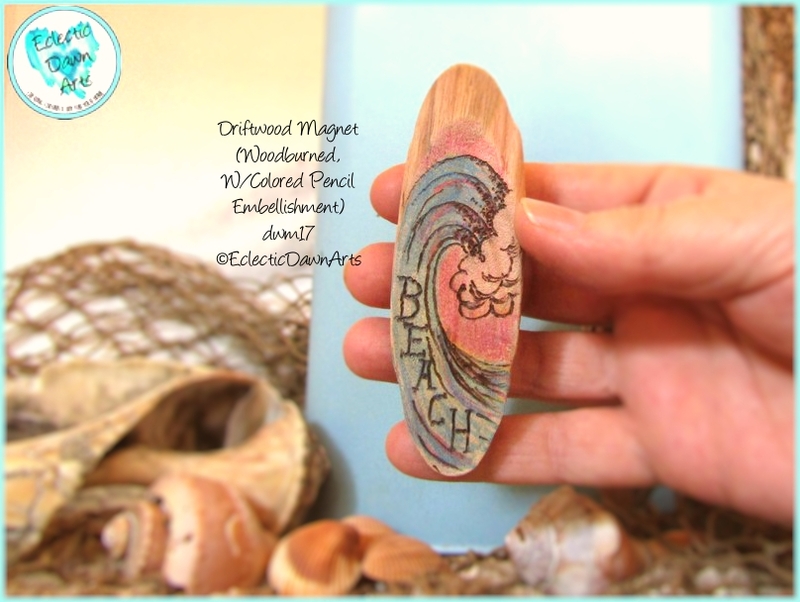 Beach Wave, Pink Sky, Magnet: Driftwood Pyrography Art Magnet, #DWM17 (accessories not included), approximately 4” x 1” oval. Bring a bit of the beach to your corner of the world with this handmade piece of ocean art. Each piece of driftwood is woodburned, then embellished with colored pencils, and left in a natural state. This is a decor object, not intended for children. Killer Whale Jumping, Orange Sun, Driftwood Pyrography Art Magnet, #DWM18 (accessories not included), approximately 4” x 1” oval. Bring a bit of the beach to your corner of the world with this handmade piece of ocean art. Each piece of driftwood is woodburned, then embellished with colored pencils, and left in a natural state. This is a decor object, not intended for children. Free Shipping. Pink Porcupine Fish Magnet, Driftwood Pyrography Art Magnet, #DWM19 (accessories not included), approximately 4” x 1” oval. Bring a bit of the beach to your corner of the world with this handmade piece of ocean art. Each piece of driftwood is woodburned, then embellished with colored pencils, and left in a natural state. This is a decor object, not intended for children. Free shipping. 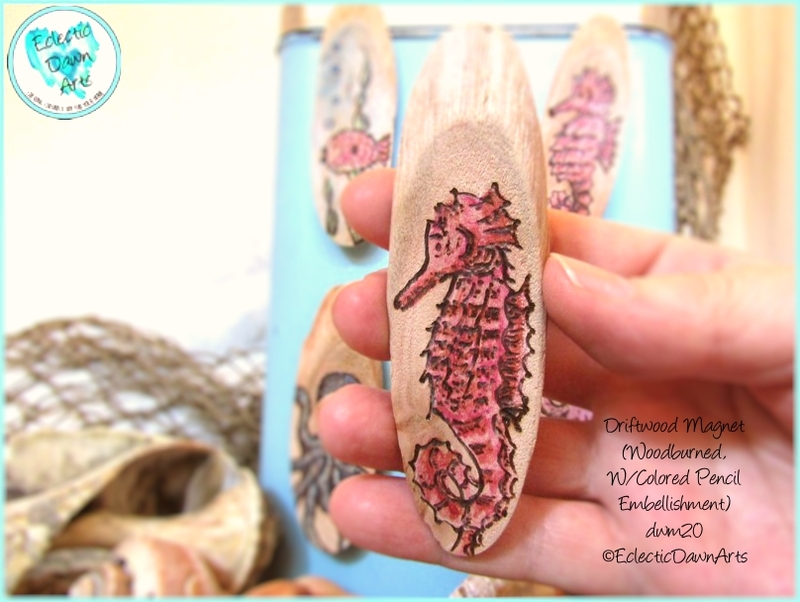 Pink Seahorse Pyrography Driftwood Art Magnet, #DWM20 (accessories not included), approximately 4” x 1” oval. Bring a bit of the beach to your corner of the world with this handmade piece of ocean art. Each piece of driftwood is woodburned, then embellished with colored pencils, and left in a natural state. This is a decor object, not intended for children. Free shipping. 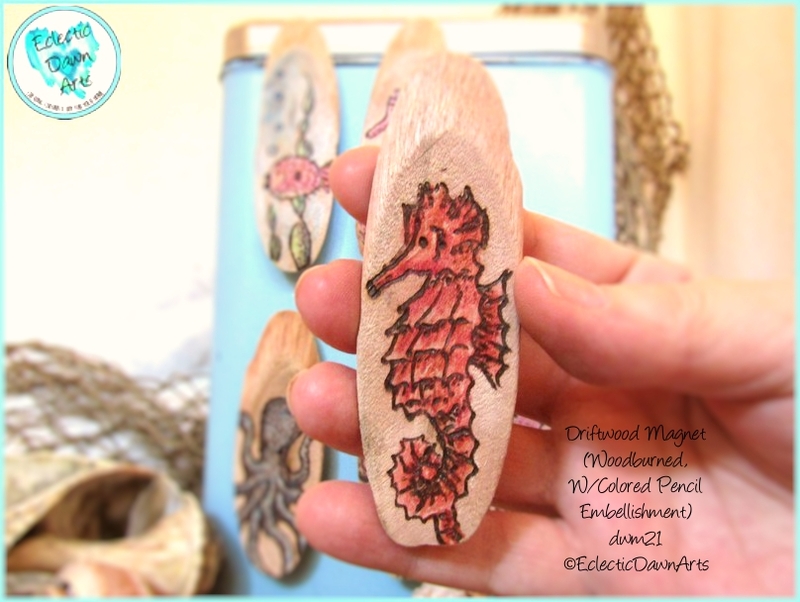 Red Seahorse Pyrography Driftwood Art Magnet, #DWM21 (accessories not included), approximately 4” x 1” oval. Bring a bit of the beach to your corner of the world with this handmade piece of ocean art. Each piece of driftwood is woodburned, then embellished with colored pencils, and left in a natural state. This is a decor object, not intended for children. Free shipping. 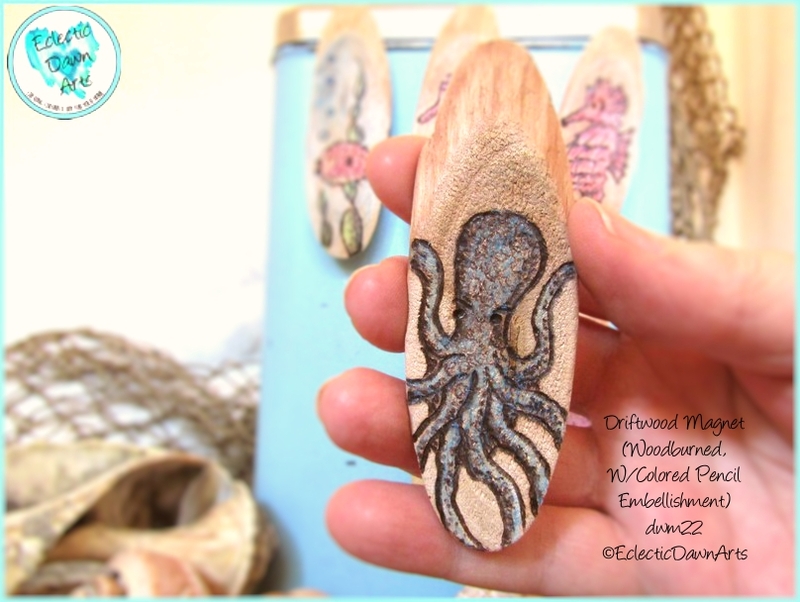 Blue Octopus Pyrography Driftwood Art Magnet, #DWM22 (accessories not included), approximately 4” x 1” oval. Bring a bit of the beach to your corner of the world with this handmade piece of ocean art. Each piece of driftwood is woodburned, then embellished with colored pencils, and left in a natural state. This is a decor object, not intended for children. Free Shipping. 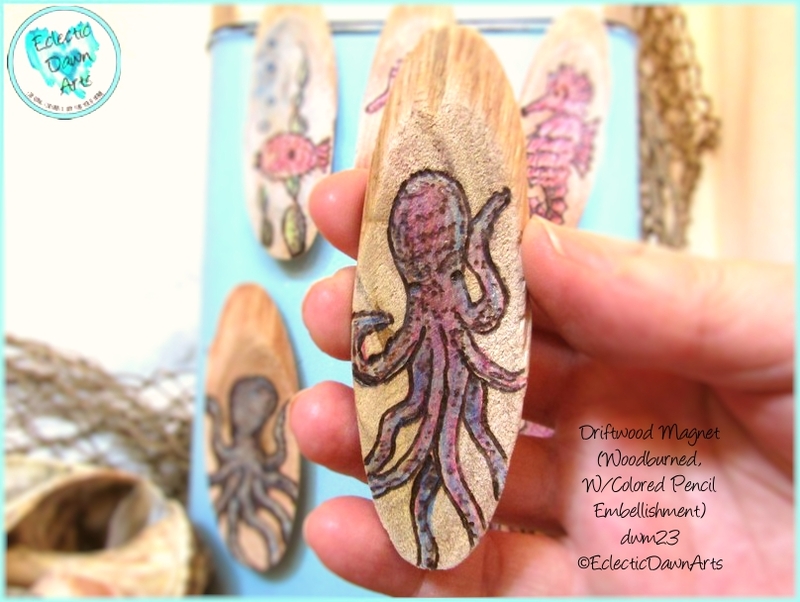 Purple Octopus Driftwood Art Magnet, #DWM23 (accessories not included), approximately 4” x 1” oval. Bring a bit of the beach to your corner of the world with this handmade piece of ocean art. Each piece of driftwood is woodburned, then embellished with colored pencils, and left in a natural state. This is a decor object, not intended for children. Free shipping. 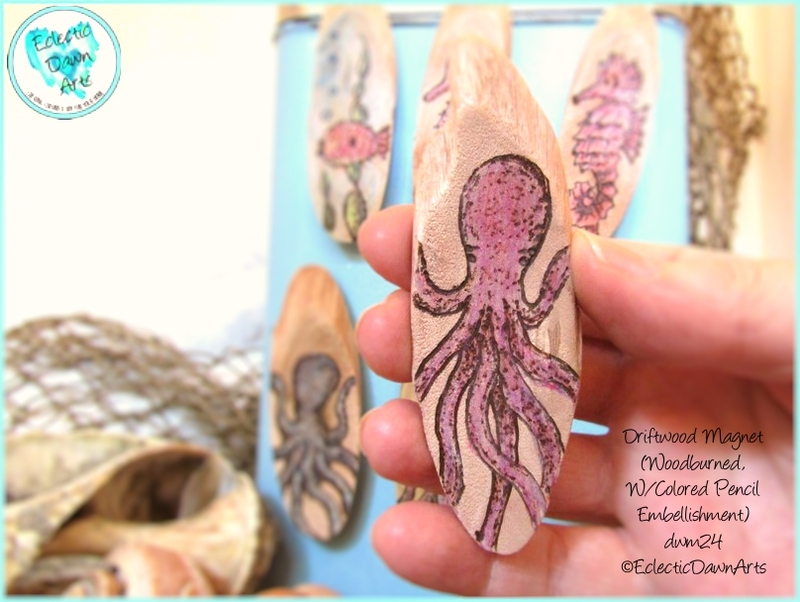 Purple Octopus Driftwood Pyrography and Pencil Art Magnet, #DWM24 (accessories not included), approximately 4” x 1” oval. Bring a bit of the beach to your corner of the world with this handmade piece of ocean art. Each piece of driftwood is woodburned, then embellished with colored pencils, and left in a natural state. This is a decor object, not intended for children. Free shipping.